Are you looking for a way to engage your family in serving others this Christmas season? We like to take the focus off of the “gimmes” and put it back on the giving of Christmas. What do we do? We decorate brown paper sacks and then fill them with holiday goodies. These don’t go out to just anyone. They go out to those poor souls who work Christmas day. The gas station attendants always get one. The look of surprise on their faces when we don’t ask for gas but instead bless them with a little treat, 100% priceless. The cashier at the grocery store or mini mart. Law Enforcement. 911 Dispatchers. The list goes on. Don’t miss an update and get freebies only subscribers receive! Our kids love doing this. They instantly see results because of the smiles and thank you’s they receive – that’s not what it’s about of course! But they fight over who gets to give. It doesn’t have to be expensive. You really never know whose heart will be touched. Put the focus of the Christmas season back to giving and Christ. Check out my easy tradition for Thanksgiving! Are you going to start a tradition like this? *Several of you have told me you are starting this on other holidays like Thanksgiving as well. AWESOME! Wraps fit perfectly inside a greeting card! *This post contains affiliate links at no additional cost to you. Thank you for supporting my family in this way. Christmas, Christmas traditions, Hospitality, Kids, Serving Others, sharing Christ. Bookmark. Super sweet idea! gonna try it this Christmas. Aww.. they are so lovely. It’s really a nice way to do with your kids. Oh, I LOVE this idea!!! So thoughtful. My kids are in the mid to late teen years, but they might even enjoy helping me do this. What a beautiful tradition! What a great and amazing tradition for Christmas Holidays, a very altruistically attitude. I bet that those persons are more than thrilled to receive a gift..from a stranger, i mean this is quite a surprise. Congratulations for your warm thoughts and for all the effort that you put in giving a smile on Christmas evening. Michelle Pohl recently posted..Judgement: Did I force my child? Thanks Liz! It is the most fun to see the reactions! What kind of stuff do you put in the bags? This is so sweet, I have been looking and thinking of something I could do like this for some time now, usually we donate shoe boxes to Operation Christmas Child, and still will, but to see the faces of the people you bless must make it so wonderful. Thank you for the idea! If you have any other ideas like this please share! This is awesome and we will be incorporating this into our day. What a great lesson on serving in a fun way! My family is going to have so much fun doing this! What a gift you’ve given those who have to work Christmas day. I remember those days when I was a cashier. They’re hard and you’re left out of family celebrations. Thanks for this idea. So starting this! 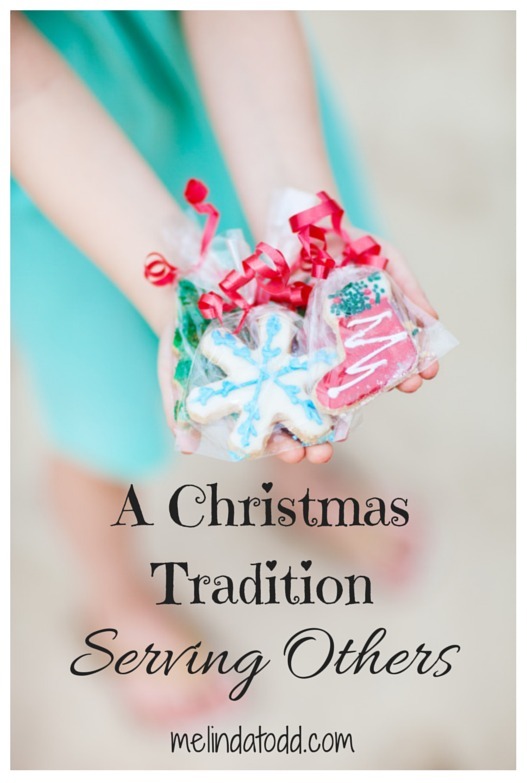 I was searching for traditions to start with my little young family and well none of them were centered on Christ or service and so I was so happy to finally find this! thank you!